In pursuit of an appropriate Word Count. To those of you that don't spend a fair chunk of their time writing, the premise of a word count isn't really that threatening. To a writer, the word count is essentially like the yard markers on a football field. If your intent to to write a novel, you know you're going to have to come up with a story in the 40k words plus range, and more likely than not in the 70k plus plateau. Some writers have no problem generating word count. I do not happen to be one of those people, for various reasons. Like many writers, I have a day job, and a child. Devoting the amount of continuous time to produce a large word count is problematic at best. As many of you may know, I am this week beginning my first full length novel, pre://d.o.mai.n. Parts of the story have been floating around in my head for a decade, and other parts are relatively new. 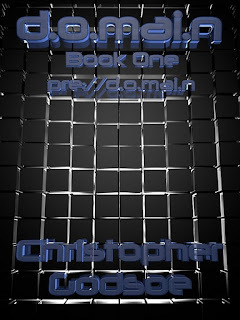 The story exists as part of a larger narrative, and will be followed by d.o.mai.n, and at least one more sequel. The characters involved also appear in my Novella "Judgment Cove", as well as my poorly neglected online serial D4RK R3QU13M (I have decided to outline and restructure the story, and have placed it on the back burner while I finish this novel). I even took my vacation now with the intent of working my way through as much of the outline as possible. I do not think that I will have much difficulty hitting my total word count as I am plenty long winded. I took what is to me a novel approach to outlining. I laid my story out in a series of bullet points which I would hit along the way, much like a comedians joke list. If I am on one point, and working my way to the next, the story is on point. It also allows me enough artistic license to ad lib a little along the way. I intentionally left the various romantic interests vague, because I thought it would be best to allow them to develop organically as I wrote, much like they happen in real life. Serendippity is a fickle creature, and relationship opportunities can't be planned with any degree of certainty (trust me I've tried). In short, I think I'll be okay. The problem is in my writing style. I could never be a freelance author. I recently finished reading Chuck Wendig's "Confessions of a Freelance PenMonkey", and as he outlines his daily routine I recognized fairly early that it was not something I could adhere to. BTW, if you enjoy writing, buy Chuck's book and check out his blog at terribleminds.com, you will be entertained, and probably learn something without meaning to. I tend to go a few days without producing much actual word count, but rolling the plot of my current project through my head. Then, I will sit down and bang out 5000-8000 words in a single sitting. It's fine for writing novels, but not so much for writing to hundreds of micro-deadlines a year. I recognize this about myself, and continue to show up at my day job. I will undoubtedly need to focus my energy a little more and produce a much more linear workflow if I am to develop into the writer I wish to become. Again, recognizing this fact pushes me to find ways to make it happen. Utilizing my surplus of personal time this vacation, I have taken to starting my day off with a film over breakfast that best captures the emotional concept that the mornings chapter is to be about. Not being able to find a copy of John Q (if it's on Netflix please keep that information to yourself, it's too late for me now) I grasped on the other underlying theme and watched V for Vendetta. After I finish this blog post I have a few hundred more words to finish out chapter two and arrive at my word count of approx. 5000 for the day. Tomorrow's chapters (I'm trying to put down two per day during my vacation) are less about oppression and more about discovery, so I plan to watch "The Matrix", and during lunch I will check out a film that embodies the loss of innocence and marking a great change in life, as my protagonist reaches a major decision. I also am working on the prize that I am going to be giving away to one lucky reader/reviewer of my novella Judgment Cove later this month when I need to get up and stretch my legs. So maybe the secret is to break up the work, to maintain "inspiration" by constantly drawing in new material that feeds the themes you hope to embody in your work. When I watch these films, please know that I am not stealing ideas from them, merely seeking to put myself in a similar frame of mind. V for Vendetta is all about taking your life back, and becoming outraged by the injustice of oppression. It worked well for day one. By sharing this I hope that it will help some of my fellow writers develop fresh ideas that they may not have tried before to combat the stretches where they can find other ways to spend their time away from the keyboard. Because we all know that feeling of accomplishment we get when we finish a work is what we are truly after, as well as the praise given to you by a perfect stranger that enjoys your work. Use whatever methods you can, whatever tools at your disposal to get into character for your story and knock it out of the park. Hey Chris - nice post! There are authors that say they need to write at least 3 pages/day. There are authors (with day jobs) that wake up at 3 or 4 am to write till their kids get up and they need to go to those day jobs. There are many different ways you can go about writing. I am not one of those authors - maybe that is why I am a writer (an unpaid author). I write when my kids let me, and when I feel inspired. It is hard enough to get a weekly blog out, sometimes, let alone 5000 words a day. Maybe that is why the novella worked for my first book. Hopefully your vacation will allow you to get quite a few words on the page, or in the computer, as it were. It sounds like your outline will serve you well. I wish you luck! Thanks Erin! Today I only managed to produce Chapter 3, and I'm actually not able to fit the few things that I had outlined all in to Chapter 3, so Chapter 4 will become partially comprised of things that I had intended to cover in Chapter 3. I am trying to keep my chapters roughly in line as far as length. I don't want one chapter that is 1200 words and another that is 3600. I have tried to pick up the pace on my blogging, and will probably have something new to show tomorrow (I have to see what partials I have stashed in my "Drafts" folder.